If you've been reading IKATW for long, you probably know how much I love facial mists. I can't really pin point why, but I do. I just love facial mists.I also happen to be a pretty fanatical tea drinker. Seriously- for Christmas my Uncle (Unc, as I call him) always gets me a huge box of tea. He makes it his mission to find me every type/flavour he can find. I just love tea. So, you can see why I got a bit excited when I was contacted by MIYU (pronounced mee-you) and asked if I'd like to try their new line. The brand has just launched this month, and is the first lifestyle beauty brand to pair teas with skincare. 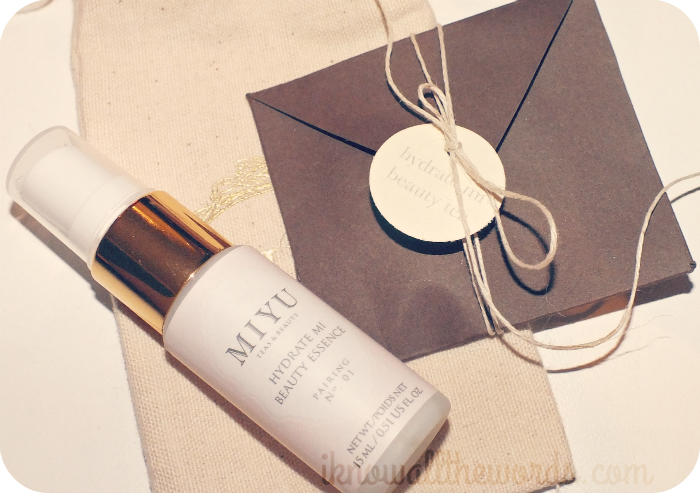 MIYU plans to 'revolutionize the beauty industry by helping women nourish their complexions from the inside out, in a delightful way.' That's a mission I think I can get behind! Read on! MIYU currently offers two ranges: Hydrate Mi- to enhance skin's ability to retain water and De-stress Mi- to sooth stress-induced aggravations. 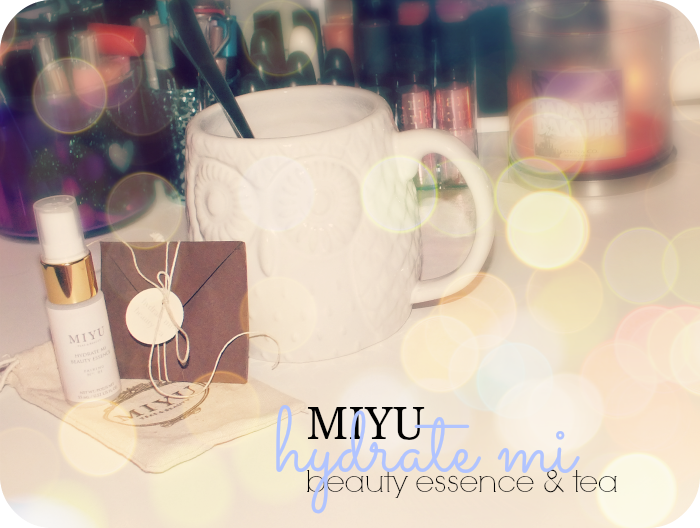 I tend to have drhydrated skin, so Hydrate Mi was the obvious choice. The Hydrate Mi Beauty Essence is formulated with wild pansies, rose, goji berries and mangosteen and has a light rose scent. The liquid is thicker than water, but still light feeling and applies with a nice fine mist. This product can be used as both a refresher and after cleansing before moisturizer. I've been using this the most after cleansing and before applying makeup as it does give my skin a boost of hydration. This is especially useful before BB creams as they apply best on 'plumped' skin and a spritz of a hydrating mist really does the job. I can't say enough about this mist! It really does hydrate well and doesn't leave any sort of sticky film on my face, which I have experienced with other mists. 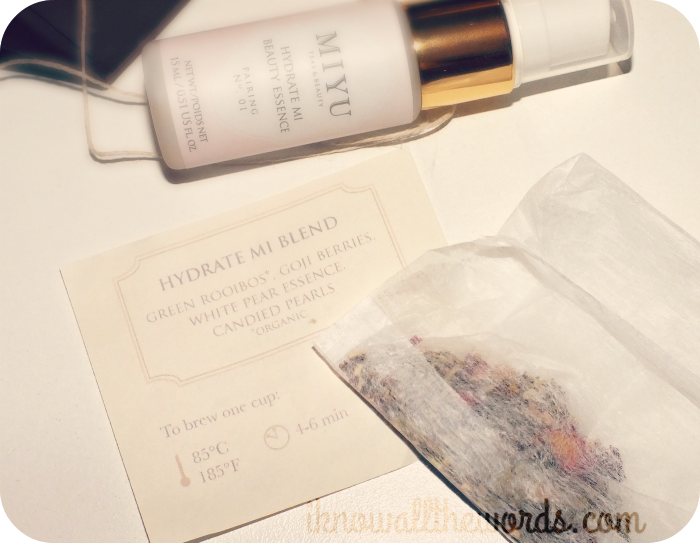 The Hydrate Mi Beauty Tea is a blend of green roobios, goji berries, rose petals and sweet notes of snow pear. The tea is caffeine free and quite tasty. You get a light taste of berry and pear that goes well with the mellowness of the green roobios. I love that this tea has been so thoughtfully blended as it not only tastes great but each of the ingredients was chosen for its specific properties. Overall, these are two great products. I know I'll be replacing my bottle of Hydrate Mi soon, and there is a big chance more tea will accompany it. I highly suggest checking out either ranges- or, for those who have difficulty deciding, there is a super cute sampler set that includes both versions of the beauty essence and tea (here). 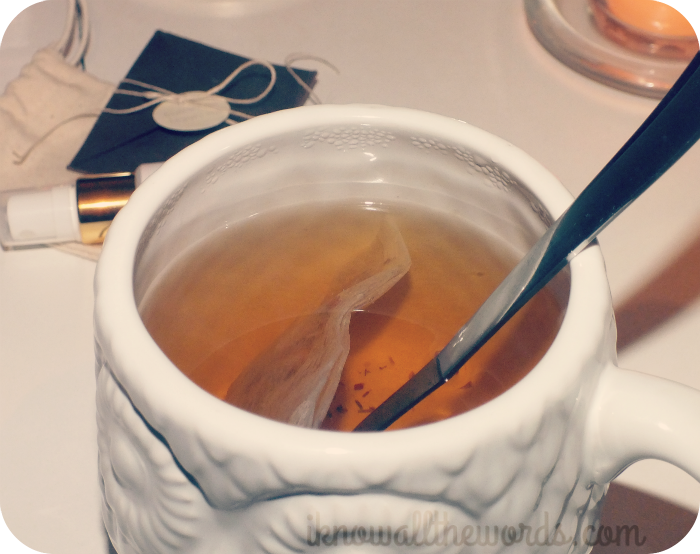 Are you a fan of facial mists or tea? Which are your favourites?